Often times, you don’t need an email today, but you will need it next week or next month, so you keep it sitting in your inbox for days or weeks. It gets buried in a sea of lost emails and you forget about it until your emails keep piling up!With FollowUp.cc you can easily forward your emails into the future – anytime. Tomorrow, 2days from now or on the 22nd of March -tomorrow@followup.cc or 2days@followup.cc or march22@followup.cc – when you are ready for your email, it will reappear at the top of your inbox.In business, important tasks often get lost unless they are scheduled or organized. FollowUp.cc makes it easy to organize your reminders from with your existing email system – so leads and tasks don’t get forgotten. 1. You can schedule reminders using the FollowUp button on the bottom of the email. 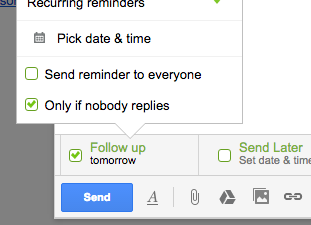 When you create a new email, click on the FollowUp button and select a date to when you want your reminder to set off. 2. 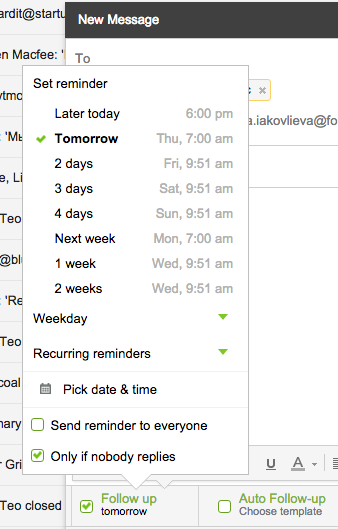 As you create a new email, you can also schedule a reminder under the Bcc input. This way, you can schedule reminders accordingly by hours, days, weeks, months, weekdays, and at what hour. The most common cancel scenario is where your recipient responds before the reminder is due. In this case, if you reply and put cancel@followup.cc in the Bcc field, it will cancel the existing reminder on your email thread. If your recipient has responded but you don’t need to reply back, you can forward the email to cancel@followup.cc and we’ll cancel the active reminder on that email thread. You can also cancel reminders from your ‘Calendar’ or ‘Agenda’ view by logging into your FollowUp account. How to see the list of all reminders? to view all the reminders that you’ve created. want a back up list of reminders you have created. need a quick overview list of all the reminders that you have set. don’t want to scroll through your inbox or account to edit a specific reminder. snooze reminders by clicking on them from one open email. Another method for updating a reminder is to hit reply to your original message (and make sure it’s going to the intended recipients again, Gmail does this automatically). Set a new FollowUp reminder in the Cc or Bcc and we’ll update the existing reminder on that thread. Response Detection helps you automate the process of following up. Turning ‘Response Detection’ on is like saying ‘Send me this reminder only if I don’t hear back from the recipient’. Here is good infographic showing how Response Detection works. How to use Response Detection? Please note that only BCCed reminders will be detected by Response Detection. You can also use it without Chrome Extension, but only with Gmail accounts. If you don’t have Chrome Extension just add a special suffix to any reminder address you want to create, for example: 2weeks+response-detection@followup.cc or for short 2weeks+rd@followup.cc. Ensure you have BCCed on the FollowUp reminder. Only BCCed reminders will be detected by Response Detection. In case you want to send a reminder without Response Detection just use the corresponding formatting: 2weeks+no-response-detection@followup.cc or for short 2weeks+nrd@followup.cc. If you want to turn this feature by default and just don’t think about it again please go to your ‘Settings’ and check the following field: “Automatically cancel reminders when somebody replies to your email”. If you have Response Detection turned on and someone replies unexpectedly, forward their response to the reminder time again to ensure that you still have a new reminder set since their response.